SteamWomen: SW3: Interview with Renate Goodwin of The Cog is Dead! SW3: Interview with Renate Goodwin of The Cog is Dead! 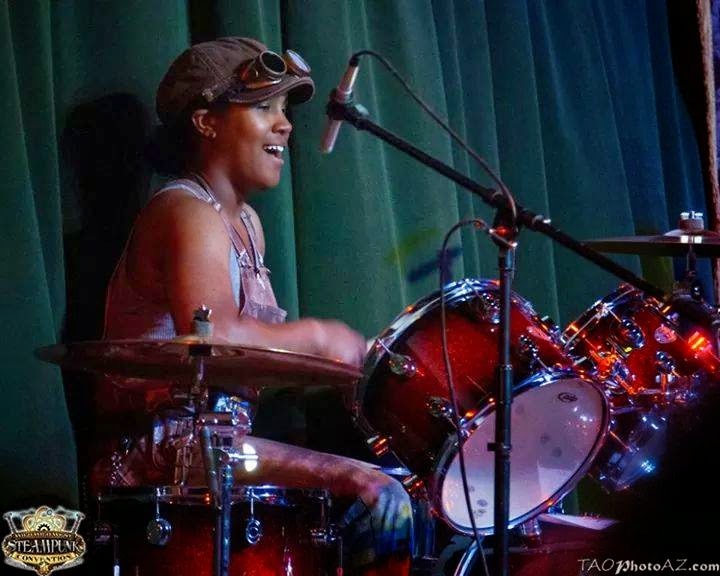 For our second interview, we're featuring Renate Goodwin/Renate Eights, the drummer/percussionist for The Cog is Dead. A 19-year-old native of Daytona Beach, Fla., she's a newcomer to the steampunk scene, but she's made a big impact thus far! It's kind of hard even for me to describe myself honestly. I guess I would say happy, hyper, maybe even a little rebellious at times. I love to smile and laugh, so I would definitely say happy. That's why I love playing music because it makes people happy. I'm already excited because I get to play drums. I get even more excited seeing everyone else get excited! That's when I start getting hyper! I am definitely a music lover. Music plays a MAJOR part of my life. Who knows where I'd be without it. You say you are a little hyper and rebellious. What was high school like for you? High school was all right, I guess. I was cool with a lot of people, so I pretty much never had any high school drama because no one disliked me. My school buddies would call me a modern-day hippie because I wore tie-dye shirts and ripped jeans or shorts. Can't really have enemies of you smile with everyone. I treated everyone the same and laughed with everyone; probably the most trouble I would get into was not showing up in class or making jokes. I was always into more fun things like skating, surfing, or going to reggae concerts so if I had to choose class over the other, class would always lose. I made good grades, though. Surprised myself sometimes with my grades! I got the best grades in weightlifting class and I was the only girl that actually worked out. The other girls would just sit around. Maybe they were too cute and pretty to work out haha. I hung out with anyone who was chill to hang with me. I didn't care what group they were with I'd hang with them. Only if a certain person was known as bad news or drama-causing person, I'd keep my distance. My closest group of friends were a few people and we would always get separated in every class we had together because we'd either talk too much or just laugh too much. They all hung out with different groups so we never met up as our own group but things like that never bothered me. How did you find Steampunk, and how do you define it? I didn't even know steampunk was a thing actually. I heard a friend mention it once or twice because we were watching Alice in Wonderland, but I was too busy in my own thing to really ask about it. My friend Bradley [Harrington, bassist for The Cog is Dead] he had a graduation party, and it was Steampunk themed. I showed up in swim shorts and a t-shirt. You can obviously tell I had no idea what was going on! The funny thing about it, he was playing songs from The Cog is Dead but we both weren't in the band at the time and probably would have never imagined being in the band either. Bradley eventually joined the band months before me and they had a local show for an art exhibit. I wanted to go to support my bro Bradley because I never saw him play with the band. We always had our own jam sessions at his place. At the show, they were playing their music and everything was going pretty cool. They had an intermission and I started talking to John's dad [Captain John Sprocket, lead singer of The Cog is Dead] because he was the drummer. He asked if I wanted to play in the set a little bit so I did a solo. John jumped on the mic and said they have one more song. I was going to hand John's dad his drum sticks back but he was like, "Play the song!" I kinda was like "ALL RIGHT!" but at the same time I mini-panicked. I had no idea how to play the song, so I just winged, and it fell together all right. It was fun! I definitely didn't regret it. John later contacted me and asked if I was down to play a show in Piscataway, N.J.! 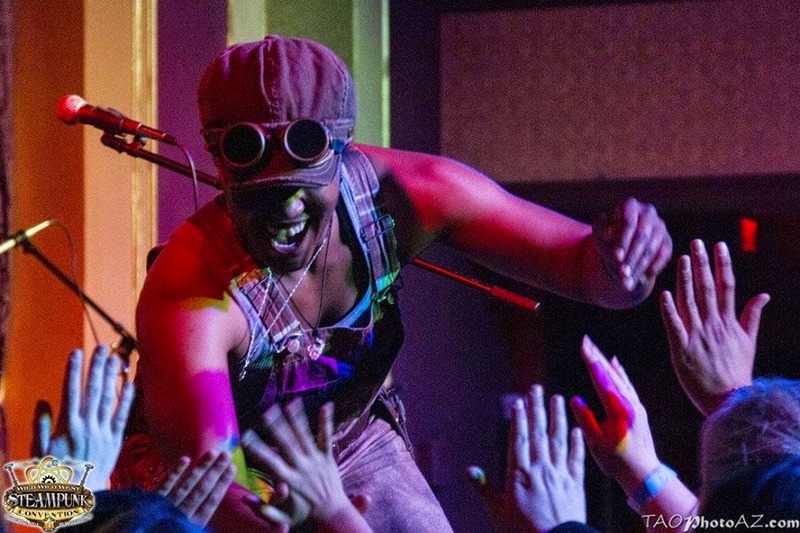 [This was the 2014 Steampunk World's Fair - ed] I was sooooo down with going North to play drums! I officially joined the band after my first show in Jersey. It was crazy mentioning to my friends that I was going out of town for my first gig with the band in Jersey! I honestly couldn't really believe it either. It was definitely weird when I saw my face on the posters! I still get weirded out by it, but it's a good weird. When I started in the band, I was already on my own at 18. So it was a big decision for me to just leave out the state. I had no home of my own, I slept on my friends' couches and floors, I had a few bags and some old drum sticks. So I figured, why not go, because I had nothing to lose. I started going to different cons for Steampunk and anime. I liked it because I actually got to see creativity from total different strangers in one area. It takes A LOT of work to get all these costumes that these people were wearing together. I like history, so going to Steampunk cons are like stepping into world where the clothes are old school but they were using iPhones and Androids. I did notice Steampunk seems more mature than some other subcultures but the people STILL know how to have fun. How do you like to get ready for a show? Before I play, I gotta put on some music on my headphones to get me ready. I'll put on Jimi Hendrix, Lenny Kravitz, Tribal Seeds, New Kingston, Red Hot Chili Peppers etc. pretty much anything that'll get me pumped and ready to play. When I get close to the stage, I always listen for the crowd, because it's my job to make sure they're happy and hyped by the end of the show. So if they aren't hyped yet I gotta make that my goal, and if they already are, let's see if I can get more out of them! When they get excited I get excited! Who do you consider to be your musical influences? If it wasn't Sheila E., I probably wouldn't be playing drums today. When I was younger I watched a live show of Sheila playing Glamorous Life. She was playing the drums, then kicked one of the cymbals with her heels! Since then, drums have been my love. My grandma would save coffee cans and boxes so I could beat on them all the time. I love most different genres of music but I love Reggae and Classic Rock. 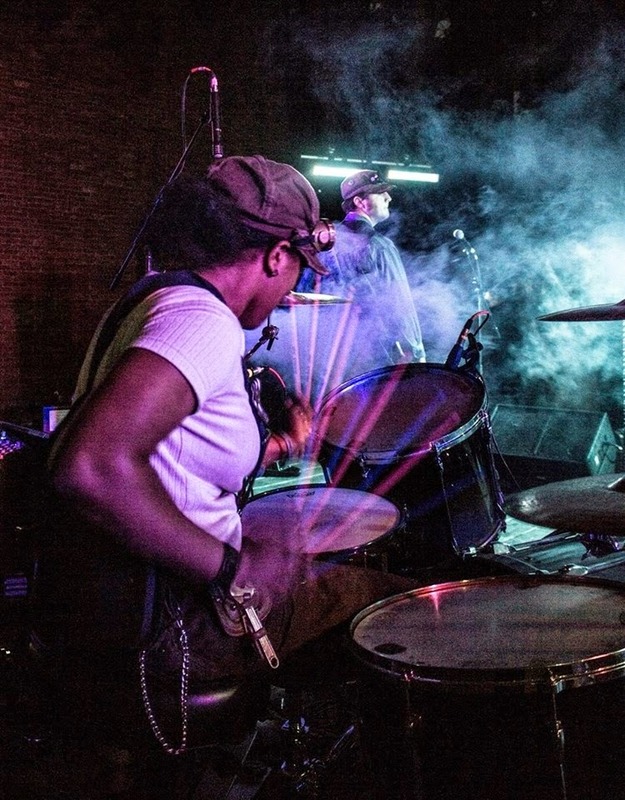 The different styles of music influences the way I play drums. It's a mix of pieces of everything Jimi Hendrix and Bob Marley have always been my inspiration to play and to KEEP playing music no matter what. They were both humble and strived to have a positive influence in people's lives. I want to have that same impact on others. Music isn't about what pays, its about the message or creativity and FUN that goes into it. That's why music in an art. Art is based off the artist's emotions. To expand my style of playing, I listen to bands like Tribal Seeds, Slightly Stoopid, Rebelution, Fortunate Youth, Steel Pulse, etc. to get a Reggae feel. For a good number of Cog songs, there is a more rock feel, so I turn to Jimi Hendrix Experience, Green Day, Led Zeppelin, and Nirvana. I also watch a lot of drum covers, so far my favorite drummer to watch is Cobus Potgieter. I love the way he plays on the set. If I named everything I would go on forever, so to sum it up, my inspiration on how I play and do what I do can come from everything and anything. Did you have formal music lessons or take music lessons in school? When did you get your first drum set? I was in band all middle school and some high school. I loved band in middle school and I never had the stereotypical issue with getting picked on as a band geek. My middle school band was actually known for being one of the top middle school bands. Plot twist! I didn't even play drums! I was a trombone player in the advanced and jazz band. I'd always try to play around on the drum set though. I never had lessons on drums. I just picked it up and practiced on my own with music books and watching music videos. I couldn't ever afford any lessons even if I did want it. Music called to me enough where I didn't have to worry about it. Drums were the first real instrument I got into and just learned in the way. I did play drums in high school though. I was only in jazz band in high school for one year because the directors never took their job seriously. I actually conducted a class because this one particular band director wanted to see if I could do a better job than him. Long story short, the band ended up playing the song correctly. Ha, the dude had pride issues and even though he didn't know how to play drums or most instruments he's always try to tell me what I was doing is wrong. I always joked around in the class (which would get me sent to the office) but played seriously when it was time to. I remember my first "rockstar" moment at our school band recital. My director thought he'd get me back by making me play congas on what he thought was my favorite song. The other kid didn't even have his own drum sticks with him so he had to use mine. We played the song and when it ended there were a few claps here and there. We got the cue to change instruments and as soon as the other drummer handed me my sticks everyone got loud! I was sooooooooooo stoked about it. I smiled so hard and waved at everyone. It was awesome hearing my own school cheer my name! I got my first drum set at 14. I worked and paid for it myself. I'd do yard work and save up for it. I seen it at a pawn shop and just had to get it. I was in between my mom and dad's homes at the time. My drum set was kept in my room at my dad's place. I'd drive him mad playing it all the time. I guess I could tell when I really started getting better because he'd let me play in the garage so the neighbors could hear me. I remember one time the neighbors across the street started coming outside dancing. I still have the same drum kit too. I just replaced a lot of the parts on it. It's my baby! What is going on with the band right now? There are future shows and a new album coming out from The Cog is Dead. June 6th, 2015, is our big show in Del Land, Fla., at the Athens Theater. It's going to be a live DVD and CD so we're trying to get people to come in and enjoy this – because it's kind of a big deal! I'm really excited for it! Do you have any advice for young Steampunks? Kids! Stay in school and make sure to stay out of trouble – but really, remember to have fun. If you want to do something that people say is impossible to do. Do it anyway. Don't let anyone, including yourself, tell you that you can't accomplish your goals. If you really want to do it, it'll happen. I always knew I'd be doing music, I just never knew when. I ended up in a band traveling the states before I even graduated high school! Also just a little suggestion, you can enjoy life wayyy more when it's based on giving and not taking. Playing drums and making music makes people happy, and that's why I love it! You said stay in school. Are you going to college for music? I'm in college now to be an automotive technician. I think they just say that to be fancy and professional. In simple terms I'm working on being a certified mechanic. I'm the only girl in my class and I get better grades than most of the guys. I think it's funny because when I first started the class, I kept hearing that it's a man's job until they realized I know what I'm doing and talking about. I get along with my whole class and all we do is joke with each other. My professors have been awesome with trying to work with me when I have shows that may slow me down in class. They always help me make up any missed work. I have been asked plenty of times before why I haven't majored in music, but I figured everyone needs a their car worked on. Having a trade is easier to fall back in when you need a little cash. I made more money working on friends' cars than I did playing my friend's guitar by the beach at home! I'm going to keep music as my career, but I'm going to use my certification to help finance it. I like engines because my dad was a mechanic, but like I mentioned before, music rules over all. It's so inspiring to read about someone following their dreams at such a young age! Keep up the great work, Renate!